Spring has sprung. The snow is melting. The birds are returning. The potholes are propagating. And the bears are coming out of hibernation . . .
Black bears tend to den at lower elevations than their grizzly cousins and have made appearances in the region on the cusp of April. For example, black bears have been seen feeding on road-killed deer. Bear tracks also have been spotted on the road to Bowman Lake in Glacier National Park. 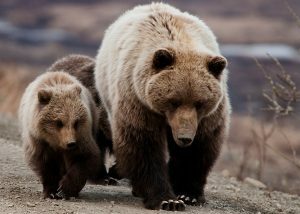 Both black bears and grizzlies will be actively seeking food in the days and weeks to come after months of hibernation. Montana’s grizzly bears are not just wandering out onto the high plains east of the Divide, they are also showing up in neighboring states to the west . 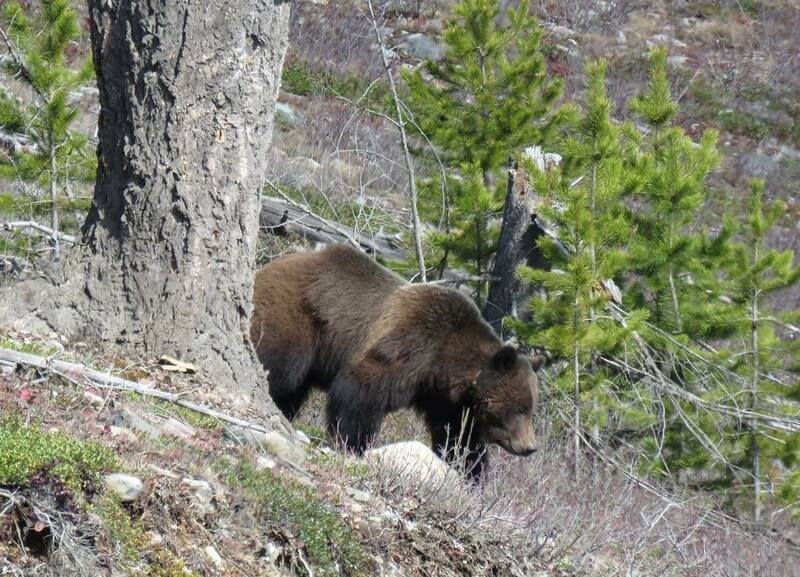 . .
As Montana grizzly bears have pushed beyond their usual mountain strongholds into the Bitterroot and Judith Basin areas, Washington state residents got a surprise visit this fall from a 476-pound grizzly west of the Pend Oreille River. 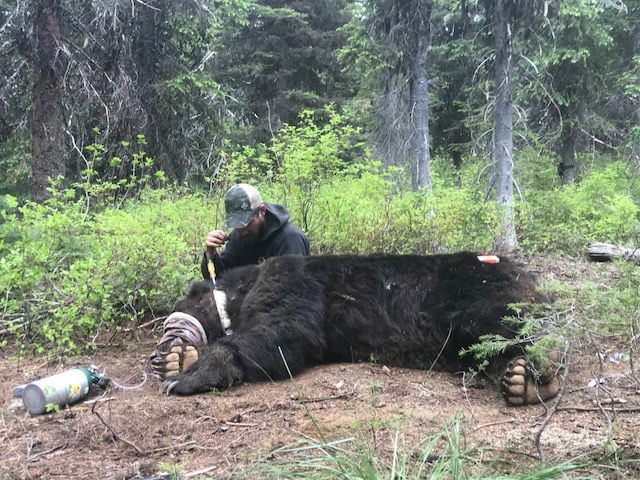 The fall update of the Cabinet-Yaak/Selkirk grizzly activity released on Friday raised another new grizzly issue. A two-year-old male grizzly that was transplanted in the Cabinet Mountains last July got spotted prowling around a black-bear bait site in the Idaho Panhandle. FWS officials captured it and released it back in Montana around the south fork of the Bull River, but it returned to the bait site in September and now is believed to be crisscrossing the border near Huron. This year’s “a fed bear is a dead bear” lesson: Those grizzlies attracted to the Polebridge area by the oats in the hay field south of town eventually forced management action by Montana Fish, Wildlife and Parks. Two are dead; one was relocated to Glacier Park . . .
It’s an active season for bears as they prepare to den for winter. Fish, Wildlife and Parks officials say they’ve euthanized two yearlings that had become habituated to humans, and captured two others. 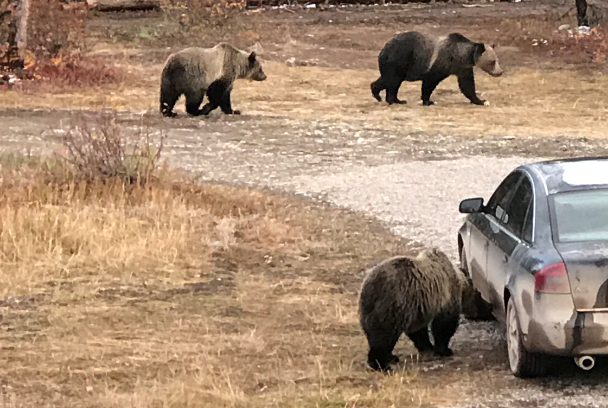 On Sunday, Oct 21, 2018, Montana FWP staff captured two yearling grizzly bears north of Polebridge and euthanized the animals. Landowners reported that the yearlings were ripping into a yurt, broke into a cooler, got into garbage, tried to get into bear-resistant garbage containers, and attempted to break into cars and trailers. The adult female was observed with the yearlings but mostly stayed in the background. The yearlings were very food-conditioned and habituated to human presence. Attempts to haze the bears were unsuccessful. In response to oral arguments by a coalition of wildlife advocates, U.S. District Judge Dana Christensen just granted a 14-day temporary restraining order suspending grizzly bear hunts in Wyoming and Idaho while decides whether the federal government should reinstate federal protections for the bears. Recommended reading for more background . 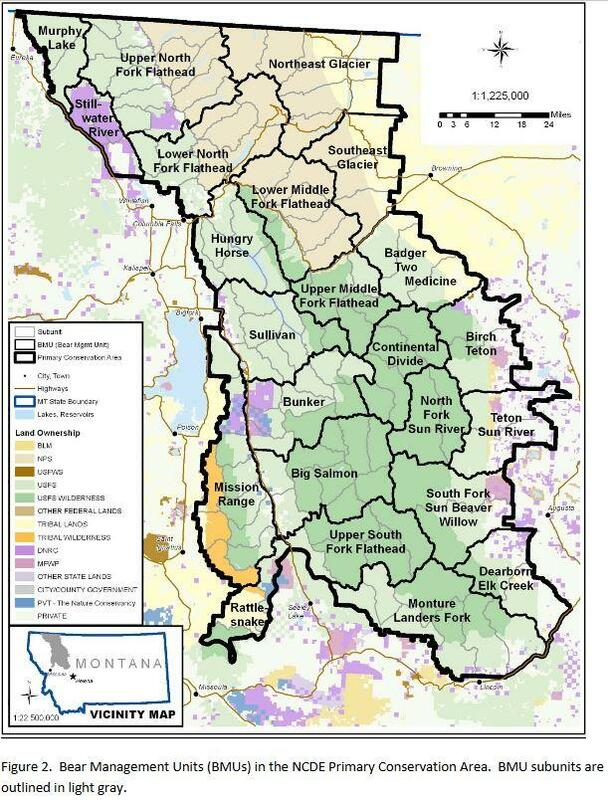 . .
Here’s a pretty good summary of Montana’s proposed management plan for grizzly bears in the northwest section of the state . . .
Wildlife officials endorsed a plan Thursday to keep northwestern Montana’s grizzly population at roughly 1,000 bears as the state seeks to bolster its case that lifting federal protections will not lead to the bruins’ demise. The proposal adopted on a preliminary vote by Fish, Wildlife and Parks commissioners sets a target of at least 800 grizzlies across a 16,000-square mile (42,000-square kilometer) expanse just south of the U.S.-Canada border. However, officials pledged to manage for a higher number, about 1,000 bears, to give the population a protective buffer, said Dillon Tabish with Montana Fish, Wildlife and Parks. This well-researched article by Rob Chaney of the Missoulian uses bear roadkill along US93 as a starting point to make a broader examination of grizzly mortality . . . The dictionary defines “mortality” as both death and loss. For grizzly bears along the Northern Continental Divide, both definitions came into play last month when the ecosystem recorded five grizzly mortalities, although only four bears died. And because two of the deaths were adult females of breeding age, the loss could have longer term consequences. 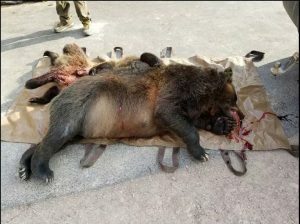 On July 24, Montana Fish, Wildlife and Parks workers found a dead sow grizzly near the southern end of Hungry Horse Reservoir in the Spotted Bear Ranger District. The 16-year-old female had a radio collar that was sending out a mortality signal, indicating it had stopped moving. The carcass was too decomposed to immediately reveal the cause of death. Three days later, the driver of a car on Highway 93 ran into a sow grizzly and two of her cubs about three miles south of Ronan. The bear family apparently came out of the barrow pit and tried to cross the highway together about 11 p.m. All three bears died at the scene. The driver and one passenger were injured and the car had to be towed away. As mentioned several days ago, a number of conservationists put in for Wyoming grizzly bear hunting tags, with no intention of hunting a griz using anything more lethal than a camera. The effort has paid off in at least one case so far . . .
A famous and fiery critic of grizzly bear hunting who’s made a career photographing the big bruins will have a chance to partake in Wyoming’s first hunt for the species in 44 years. That person is Images of Nature wildlife photographer Tom Mangelsen, who beat very long odds, drawing No. 8 on an issuance list that will allow up to 10 grizzly hunters into the field starting Sept. 15. Mangelsen learned of the results Thursday morning, when he took a call from his friend and assistant Sue Cedarholm. Spring has sprung, which means bears are emerging from hibernation and heading to the valley bottoms looking for something to eat. This piece from Montana Fish, Wildlife and Parks is a pretty good write-up . . .
Bears are emerging from dens across northwest Montana and residents are reminded to remove food attractants from their properties to avoid conflicts. Montana is home to grizzly bears and black bears that roam the mountains and valley floors from spring through late fall before denning in wintertime. Starting in mid-March, bears begin emerging and move to lower-elevation areas seeking food. Montana Fish, Wildlife & Parks encourages residents to “Be Bear Aware” and remove attractants every spring by April 1. “With this year’s above-average snowpack, bears are coming out of their dens and digging out from several feet of snow. There’s no place for them to go but down toward the valley floor to feed,” said Tim Manley, FWP Region 1 Grizzly Bear Management Specialist. Residents are asked to remove or secure food attractants such as garbage and bird feeders and bird seed. Chicken and livestock should be properly secured with electric fencing or inside a closed shed with a door. From NFPA President Debo Powers . . . 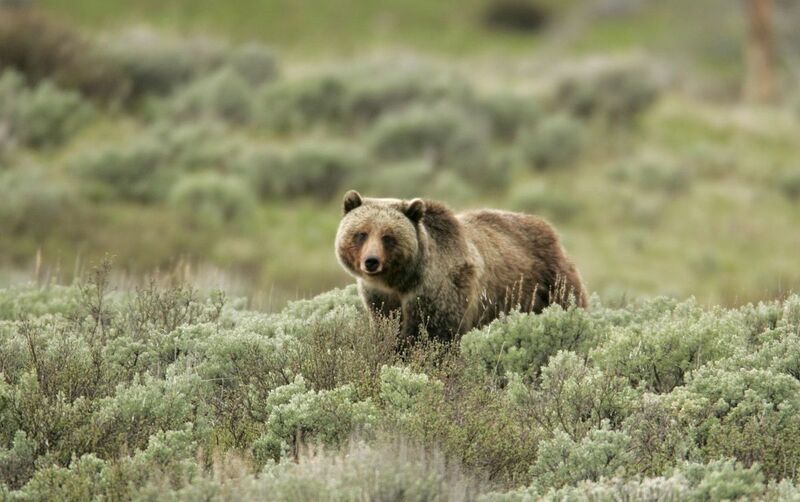 The Wyoming Game and Fish Department announced today a proposal to allow two dozen grizzly bears in the Yellowstone region to be killed through a state trophy hunt. The announcement comes despite strong public and tribal opposition to trophy hunting of the iconic bear and litigation challenging the removal of Endangered Species Act protections last summer. NFPA is opposed to the trophy hunting of grizzlies. Here’s a write-up by the Jackson Hole News & Guide . . . 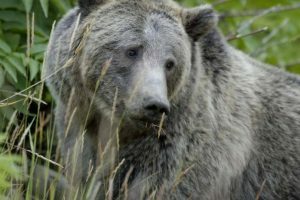 The first Wyoming grizzly bear hunt in over four decades will target 24 animals if commissioners who oversee the state’s wildlife sign off on a proposal released Friday. A topic of fierce controversy, the hunt is being devised in a way that state officials hope will limit the chance of the bold large carnivore being shot in public view, or killed adjacent to Grand Teton National Park. 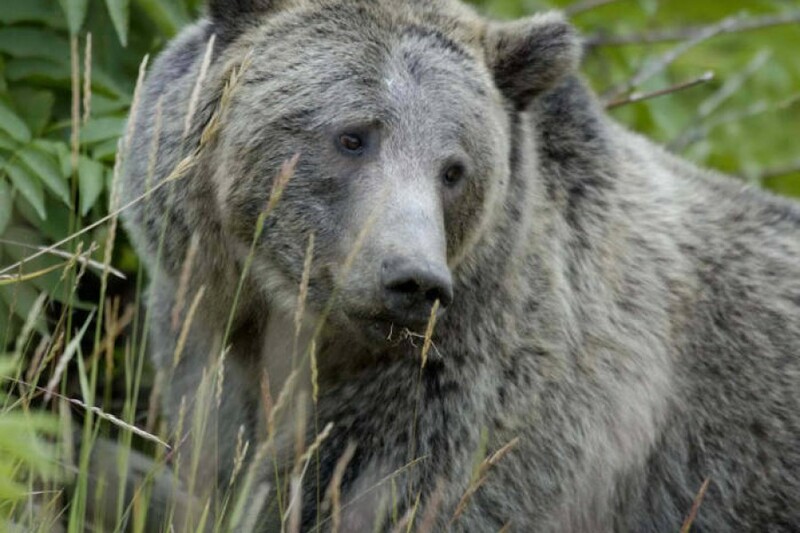 A no-hunting zone will abut the east boundary of the park, and throughout the Greater Yellowstone Ecosystem it will be illegal to kill a grizzly within a half-mile of a named highway, Wyoming Game and Fish Department Chief Warden Brian Nesvik said. “The intention is to address public concern that was focused on there being hunting and wildlife viewing going on at the same time,” Nesvik said. 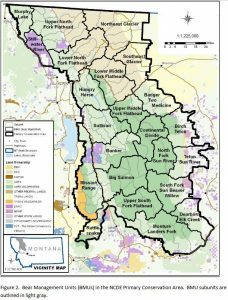 Montana FWP is recommending against a grizzly hunt in 2018. The official press release has the details. The Flathead Beacon posted a less bureaucratic summary of the issues . . .
Montana wildlife officials are recommending against holding a grizzly bear hunt in 2018 after the animals lost their federal protections across a three-state region around Yellowstone National Park. 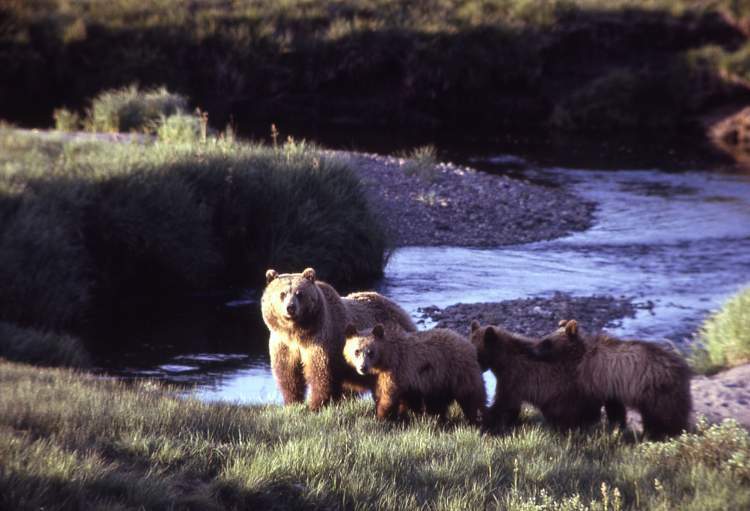 Fish, Wildlife and Parks Director Martha Williams said Thursday the state wants to demonstrate its commitment to the grizzly’s long-term recovery. State wildlife commissioners will consider the matter Feb. 15.